It’s always exciting when the first Make Cycle of the Making Learning Connected MOOC kicks off, and yesterday, it finally did. The faciliators — two colleagues from the Tar River Writing Project — of the Make Cycle want to do a little twist on how we go about introducing ourselves, by bringing a sort of media mediation into the mix. The theme this week is Unmaking Introductions. Let’s consider the ways we name, present, and represent ourselves and the boundaries or memberships those introductions create. 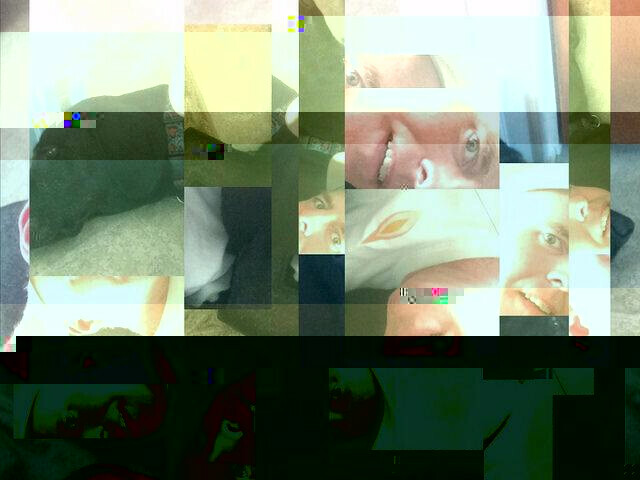 Among the suggestions to explore is to slice up and glitch some media. I see the use of intentional glitch as a way to upend our expectations of media, to turn the expected into the unexpected, and maybe find something new in the mix. It’s interesting because we often think of a “glitch” as something broken (like in the clip above, where her glitch is later what saves the day). But mistakes and miscues, and the unexpected are what makes life interesting. 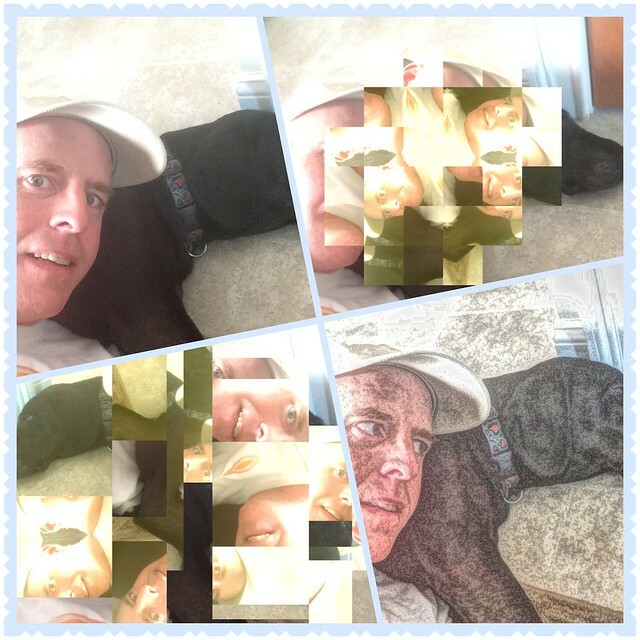 I began with a photo of me and my dog. 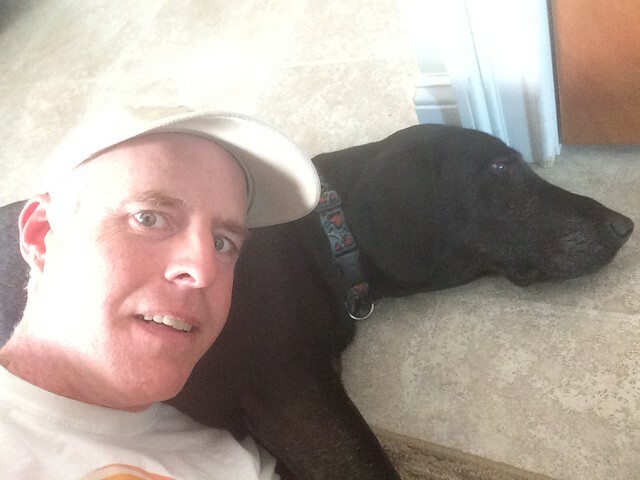 I use the handle/moniker Dogtrax in a lot of social media spaces. It has nothing to do with dogs, although I often make canine-inspired jokes. You can read more about my nickname here, if that interests you. Hey, I do love dogs. (Cats are cool, too, so no hate comments, please). And my dog, Duke .. he is pretty cool. He puts up with a lot from our family. (We feed him, so that helps). and then this collage with another app. The bottom right image was done in another app, and it was another image where my eyes look up. That simple movement changes the flow of the collage, don’t you think? and then I used an online site called Image Glitch Experiment suggested by Make Cycle facilitators for creating “glitch” images to make this version. The small bands of color seem to me as if there is a television set going, and the lower half of the screen — all dark — changes the composition of the image, too, giving contrast to the light. I’ll keep exploring how media impacts identity. It’s an intriguing topic. This entry was posted in Making Learning Connected MOOC, Slice of Life, Technology Resources. Bookmark the permalink. I LOVE how you are always stretching and challenging yourself! What a great model you are to us all. Is that a SOLSC shirt I spy in the photo? 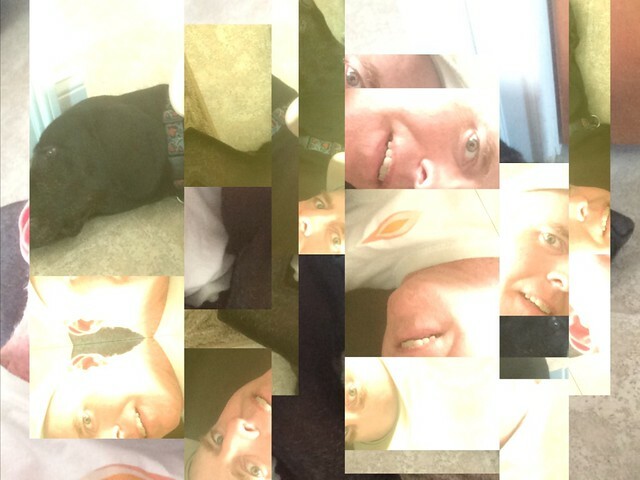 Kevin, your glitch collages are full of fun and inspire me to create. Do you have a glitch offering for Spring’s Symphony Gallery that I am in the middle of designing. The glitch is that I can’t get it out fast enough. Your creativity never ceases to amaze me. Looks like so much fun! Wow! Your creativity knows no bounds Kevin. Bravo!